WINNWELL DOESN’T JUST MASK ODOURS, WE ELIMINATE THEM. WINNWELL equipment features patented CleanSport NXTTM technology that kills bacteria that causes odour with a specifically treated fabric. 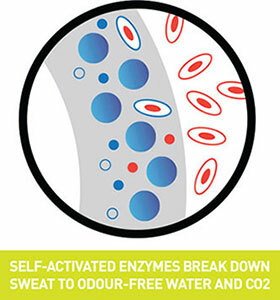 The fabric contains beneficial microbe and enzyme systems that digest the sweat and odour, instead of just masking it, so it’s guaranteed to work for the lifetime of the equipment.